The news coming out of the weekend was focused around the UFC On FOX 8 event held in Seattle, Washington and for Albuquerque trained fighters, the night didn’t go as planned. Also in action this weekend, FIT NHB’s Amber Brown competed in Japan and more than a handful of southern New Mexico and El Paso fighters competed for the Rocktagon MMA event. Coming up one judge short on the final scorecards were a common theme Saturday night in the Key Arena for the nationally televised UFC event. Three fighters representing Albuquerque battled tough opponents and all three were just one round short on one score card from bringing home the wins. FIT NHB’s Tim Means fought valiantly in his bout with Team Alpha Male’s Danny Castillo. On paper this bout was slated to be a striker vs. wrestler duel and that is exactly what fans saw on Saturday night. Means won on the stand up exchanges but Castillo fought strategically in taking Means down repeatedly to control the striker on the ground. Despite his effective ground work off of his back, the judges awarded Castillo two of the three rounds. Two fighters representing the Jackson-Winklejohn camp were also in action on the undercard with the first being MMA veteran Aaron Riley taking on Justin Salas. Riley was coming off of a lengthy layoff from competition and showed his toughness and grinding ability remained as one of his strongest intangibles. While he could never find his full offensive rhythm, Riley fought hard throughout the three rounds ending in a split decision loss. One of WMMA’s premier fighters Julie Kedzie battled the former professional kickboxer Germanine de Randamie. Kedzie put on another exciting performance to add to her illustrious career taking it to the striker throughout the three round bout. While Kedzie excelled throughout, Randamie found more consistent success with the clinch where Kedzie seemed to just continually get stuck in. Kedzie showed her striking and grappling skill immensely but would come up just short, losing a split decision in fight that many argued should have been scored in her favor. Rocktagon 28: Journey of Champions was a televised event held in El Paso that received lots of coverage and came with loads of anticipation. Las Cruces trained Billy Colon and El Paso’s Martin Sano had one of the most exciting 30-second fights ever. SWFight.com featured the video on the Facebook page this weekend and showed the intense battle between the pair that ended with Sano stopping Colon with strikes. 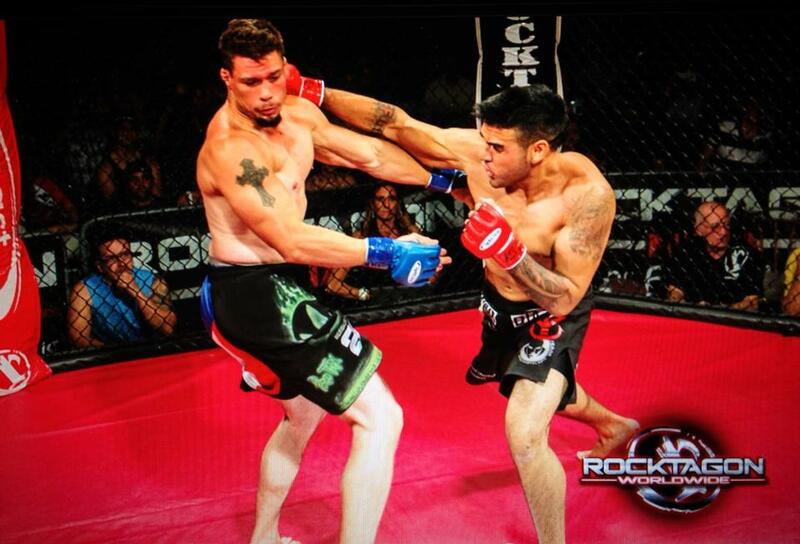 New Mexico’s Joe Torrez and David Ruelaz also came out of their Rocktagon fights with defeats. A bout featuring two New Mexico fighters, Jesus Urbina vs. Alan Lerma ended with a first round submission in favor of Urbina. While the night didn’t go so well for New Mexico trained fighters, El Paso’s Bushido MMA Fight Team was impressive throughout capped off with the win by Martin Sano. Standing out as the most impressive fighter in action of the weekend, and arguably the month entirely was FIT NHB’s Amber Brown. After suffering her first career defeat for Japan’s Pancrase promotion just two months prior, Brown returned to Pancrase and defeated one of the top ranked Atomweight fighters in the world in Kikuyo Ishikawa. Brown showed some of the vaunted FIT NHB and Arlene Vaughn flavor of striking as Brown battered Ishikawa from within the clinch. Impressively, Brown showed her grappling had definitely improved as she locked in a fight ending armbar late in the third round. The win is remarkably huge for Brown and she may be the dark horse for “Upset of the Year” in MMA. Ishikawa was ranked as high as fifth in the world by one ranking system. With the win Brown also finds herself ranked tenth in the world at 105-lbs by another ranking body. Amber Brown defeats Kikuyo Ishikawa via 3rd round arm-bar Ishikawa was ranked fifth in the Unified Women’s Mixed Martial Arts Rankings at Atomweight. Fightmatrix.com now has Brown ranked 10th in the world after previously not being ranked at all. To see the full fight – Martin Sano Jr. vs Billy Colon click here. Are New Mexico Standout WMMA Stars Michelle Waterson And Amber Brown UFC Bound?